Delonghi Espresso Machine Review: How to Become a Home Barista? 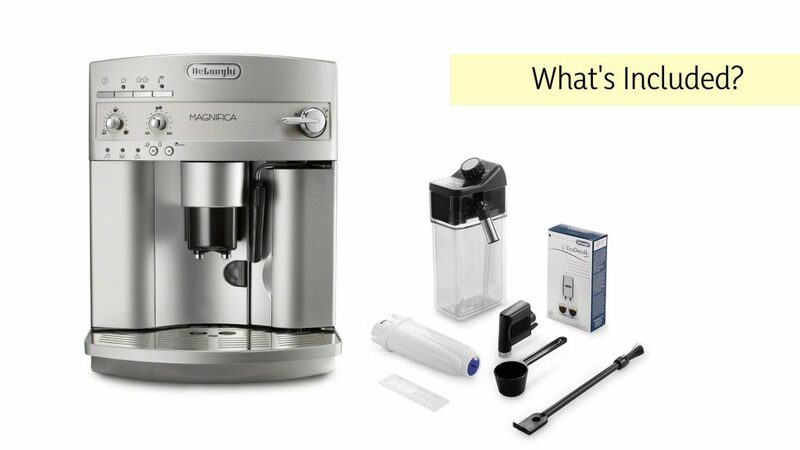 Coffee Geek Lab / Delonghi Espresso Machine Review: How to Become a Home Barista? Long gone are the days when drinking instant coffee could be enough for coffee lovers. Now, thanks to the third wave coffee shops, customers crave a quality product. From espresso to flat white, coffee snobs know the difference between all coffee drinks. Every single day true coffee lovers come to coffee shops to rely on baristas who stay aware of the latest coffee trends and the newest brew methods. But: Is it possible to make great coffee at home? Can you just buy one of those machines where you get coffee with the press of a button to satisfy your needs? The short answer – yes! The trick is to invest in a coffee machine that can make a coffee type you prefer. There’s no need to be a professional barista to brew it if you have a great device at home. To choose a perfect coffee machine for your home, you need to find a reputable brand with an army of fans whose loyalty proves the quality of devices. Anyone in search of a perfect coffee machine, you need to look no further. I have a one-size-fits-all solution for all your coffee lovers in your household – Delonghi automatic espresso machine! When it comes to coffee machine brands, Delonghi needs no introduction. Let the brand reputation speak for itself: being on the market for over 100 years, Delonghi sells its products in more than 75 countries. With a wide variety of its coffee machines, it may be hard to understand which one suits your needs and budget. 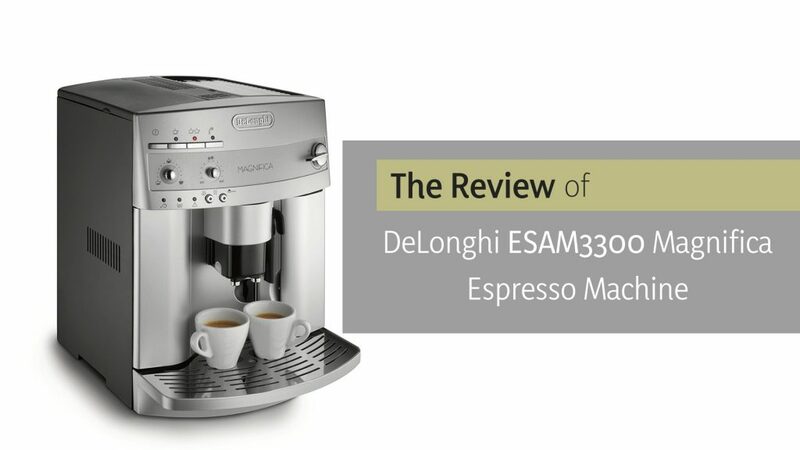 After analyzing the market, reading online reviews, and using the coffee maker for a week, Delonghi ESAM3300 Magnifica seems to be a perfect choice for most coffee lovers. If you want to enjoy both a drip coffee and a shot of espresso, Delonghi Magnifica can be the all-in-one versatile option. To make a long story short, let’s start with a short preview of the device. Water Tank 60 fl. oz. Although it’s a multi-functional brewer, it’s quite pricey so this coffee machine may not meet your budget. If you can’t afford Delonghi right now, consider cheaper options – Ninja coffee bar brewer or Nespresso Inissia. If its cost sits well with you, read why this Delonghi espresso maker is worth the extra money. With over 100 years on the market, Delonghi company has gained customers’ loyalty and trust. This manufacturer produces all types of coffee machines – fully automatic, automatic, manual, and all-in-one. Thus, it’s no wonder even the pickiest customer can find a coffee maker he or she will fall in love with. Delonghi ESAM3300 Magnifica will impress even the most demanding users. After testing it for a week, I can tell you it’s a great bean-to-cup coffee machine that grinds coffee beans right before brewing for exceptionally aromatic espresso. Whether you want a single or double espresso shot, this machine can offer you 5 strength levels and 4 length levels. It can brew either ground coffee or grind beans for a chance to meet your needs. Read more about the common features it has. To begin with, you’re welcome to learn more about the coffee maker anatomy. It can help you use the machine and take proper care of it. Once you know its elements, it’s high time to understand more about its key features. 15 bar pump pressure helps to make the finest brews and avoid a bitter taste. direct-to-brew system takes coffee beans, grinds them, and brews the freshest espresso on its own. instant reheat function keeps the perfect temperature for brewing. double boiler system has two boilers with a dedicated function for each, so there’s no delay between brewing and steaming. programmable menu setting helps to set your preferable strength and cup size by default. adjustable coffee spout lets you put your favorite cappuccino glass. a removable drip tray with level indicator makes the cleaning process easier. 60 fl.oz. removable water reservoir is big enough for the whole household. 8.8 fl. oz bean holder keeps enough beans for making coffee without refilling. patented cappuccino system helps to create perfect froth for lattes and cappuccinos. automatic shut off mode helps to save energy and switches off after 3 hours. decalcification indicator tells the user when it’s time to clean the machine. cup warmer preheats the cup for better user experience. 2-years warranty provides the user with an opportunity for the repair or replacement. Since choosing a coffee machine for home is a personal decision, there’s no one-size-fits-all approach to selecting the best coffee maker. And no matter how many features the coffee machine has, it has both pros and cons that should be taken into consideration. 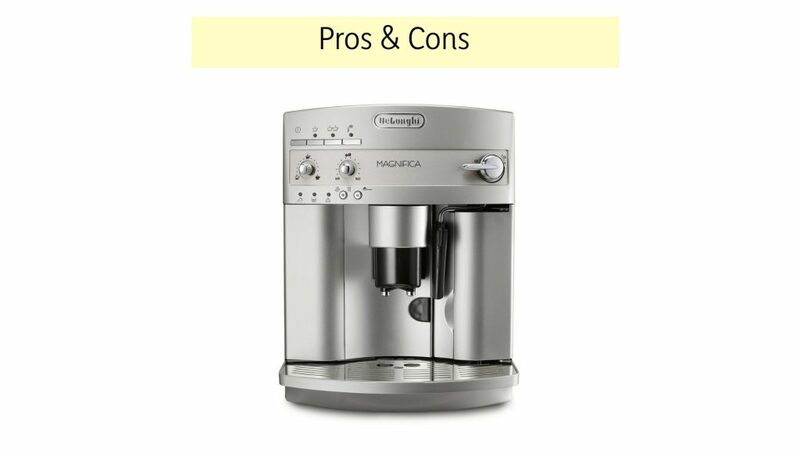 When it comes to determining whether Delonghi espresso maker is right for you, the pros and cons list is a great way to start with any decision. As you can see, this coffee maker has many benefits that can provide a great experience of drinking coffee at home. Plus, it has an attractive design that can fit any kitchen design. If you want to understand why you should take this device into account, think about its beneficial features. First of all, the machine has two stainless-steel boilers that make the brewing process faster and there’s no need to wait between making espresso and latte. Delonghi also keeps the perfect temperature with the help of its instant reheat function, so there’s no need to hurry up with brewing coffee cups one after one. Why? Delonghi Magnifica has a cup warmer that preheats the cup for better user experience. As a result, you can get your perfect cup of coffee whenever you want it without waiting too much. Hold on… Want to know the best part? This coffee maker has auto shut off function that saves energy. If the coffee machine isn’t used for 3 hours, it turns off automatically. Moreover, it comes with a 2-year warranty that covers all kinds of manufacturing defects, so it gives me the reason to trust in the quality and longevity of the product I have purchased. Now, let’s tackle extra options. What about becoming a home barista? To make the best latte/cappuccino, use skim or 2% milk at refrigerator temperature. Are you obsessed with the idea to give Delonghi a try? I’m here to share my experience with you! So, keep on reading to find out what you can get with the purchase, how to use and clean the coffee maker. For many users, the quality of a coffee machine matters as well as its features and functions. However, the unboxing experience plays a great role, too. Unboxing is a part of the entire customer experience, and I was thrilled about finding what’s inside apart from the coffee maker itself. Who else wants to know what’s in the box before purchasing? Here we go! NB: you can also buy additional stuff like an exclusive line of drinkware or care kit line. Although this coffee machine is easy-to-use, you’d better start with reading the owner’s instructions booklets. Plus, there’s a DVD with instructions that can help you understand the using process better. Prepare your coffee machine for using: set it up and clean. Fill the water tank and the container with coffee beans. Set the desired espresso strength and length. Customize the espresso temperature and brew coffee. The bottom line? It is a full-size automatic machine that is easy-to-use. Once you’ve decided it’s right for you, you will fall in love with its intuitive design and multi-functional system. The life expectancy of a coffee maker depends on its material and proper care. If you look after the device and clean it regularly, the life expectancy of fully automatic espresso coffee machines can reach 10 years. To increase the longevity of the machine, read the list of do’s and don’ts for its proper maintenance. wash the infuser, grounds container, water tank and drip tray in the dishwasher. The good news? 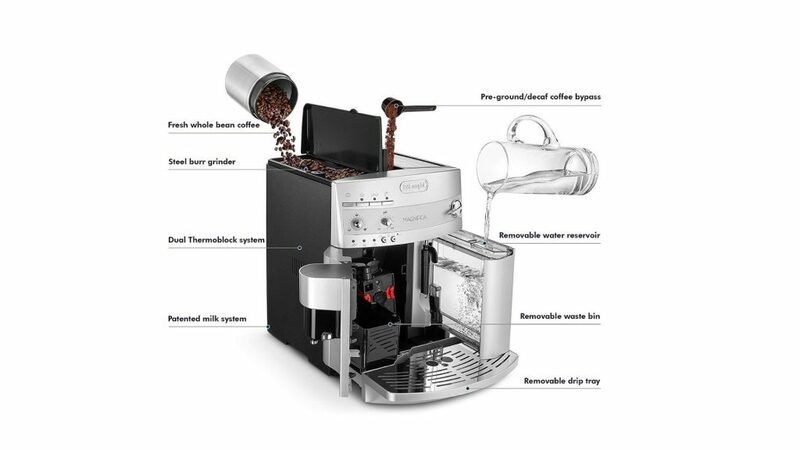 This machine purges itself before making a new cup of coffee, and this function is provided to keep all inner parts working clean and great. However, it’s recommended to descale the boiler every 3 months, and the machine has the decalcification indicator that will remind to clean the device once it’s needed. To make the cleaning process easier, get a care kit line. big families with different coffee preferences: the combination of a double boiler system and the water tank capacity, make it real to satisfy all coffee snobs’ needs in your household. couples who love drinking coffee in the morning: with this coffee machine, you can brew two cups of coffee at the same time which gives couples an opportunity to drink their favorite beverage together. frothy coffee drinks lovers: it’s possible to make various coffee-style drinks, and the spout helps to avoid milk with poor froth or large bubbles, so you can get a perfect cup of latte with one touch. coffee-addicted who drink more than 3 cups a day: with a large water tank (60 fl.oz. ), coffee lovers can enjoy up to 12 cups without refilling it. people who want to master coffee brewing skills: since it’s a multi-functional espresso maker with the milk frother, it’s just perfect for improving barista’s skills. Although this coffee maker can be a great fit for many people, it’s hard to say that it is for people pressed for time or money. It’s not only expensive but it also requires time to take proper care of it. Delonghi is a reputable brand with a great variety of coffee machines for any taste. The truth to be told: it was difficult to choose one Delonghi coffee maker out of all options. However, Delonghi Magnifica is a good coffee machine with many functions that can make your brewing experience unbelievable. From a large water tank capacity to energy-save mode, it’s built to create the best customer experience at every stage of the coffee making process. Moreover, its durable stainless steel material and 2-year warranty hints at the quality of the device. Obviously, it can’t be perfect for all people hoping to find a coffee machine for home usage. For me, this coffee maker is pricey. However, if its cost meets your budget, Delonghi ESAM3300 Magnifica is above reproach. With all its functions, this coffee machine is totally worth the money. So, what do you think about Delonghi espresso maker? Share your thoughts with us!